This is one of those things that I eat all the time and I've promised myself for years I'd learn how to make at home, but never have. Thanks to a glut of chicken in the fridge and a severe bout of desperation over tonight's recipe of choice, I was grateful that the lovely Lorraine Pascale came to the rescue (again) with her Home Cooking Made Easy. I'm still very much in love with the teriyaki chicken I made last week and was really wanting to make that again already; but that would've left me short of a new recipe trial for today so this was a good alternative. Like all of the recipes in the book (or the ones I've tried so far), it's easy. My only gripe being that she tells you to use a regular frying pan and yet you'll have no chance of achieving recipe-book-perfection because the ones in the picture have quite clearly been cooked in a griddle pan. I do own a griddle pan but it's a b*gger to clean and I always manage to set the smoke alarm off when I use it so thought that an even, rather than stripy, colouring to the chicken was sufficient. The sauce itself was far thicker than the one in the book looked. I used more liquid than recommended but still it was more of a paste than a dipping sauce. The flavour was a bit too intense for my liking too, although this could be because I (for some reason) picked the sushi seasoning (a mix of Mirin and brown rice vinegar) out of the cupboard rather than plain Mirin or plain rice vinegar. But it was well balanced meaning that you could taste the slight heat of the chilli and the pungent garlic without losing the salty-sweetness of the peanut butter. 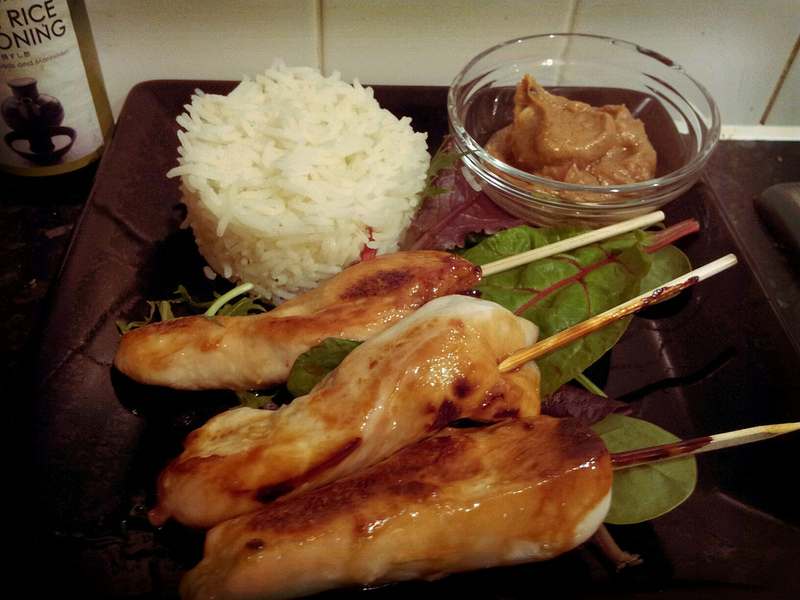 I loved the touch of glazing the finished satay with a little honey. Previously the skewers had looked a little insipid (like they do in the book, actually) but a quick bathe in some warmed honey and they were working a mahogony tan that Christine Bleakley would be jealous of.